Daria Shualy is Don Draper/product marketer at daPulse. And thus started a month of hectic preparations. As if a six-person startup with zero paying customers at the time didn’t have anything better to do. Our founder, Roy, designed t-shirts, I came up with an original giveaway which our designer slaved to execute, we issued new sleek business cards, bought cables to connect the screen at the booth to our computers. Then we hacked the Summit’s site for a list of all participants and crossed-referenced it with other lists we hacked from LinkedIn and AngelList to generate a new list of potential leads. 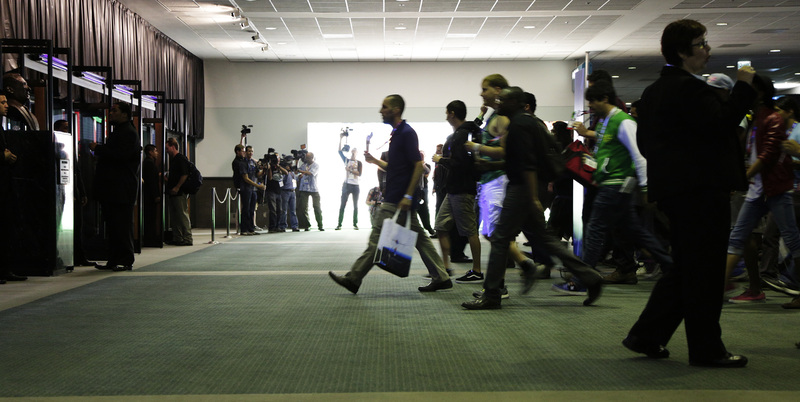 Then we started working on our pitch and demo — what we would show people coming to our booth. There were endless meetings (we never have endless meeting. Not even half-endless). We wrote dozens of tag-lines on the whiteboard, debated them, crossed them off. I was in a race against time to find an insurance company to insure me flying at eight months pregnant. We sweated over the preparations, because like all founders, we too were told how important tech conferences are. Over the years, investors have told us tales of glory about that company that launched at that summit and got a million users within 24 hours. The Summit in Dublin was just the new kid on the block. Despite the fact that conferences are time consuming, expensive and quite-distracting, founders make a point to attend them with new business cards, new shirts and high hopes included. In our personal survey, 66 percent of c-level founders attended up to 10 such conferences in the past two years. We landed in Dublin on the crisp morning of October 28, the morning of the Dublin Marathon. The summit put us up at the lovely Bewley’s Hotel in Ballsbridge. When we got to the summit itself, we were prepared: We knew our pitch perfectly. We had the list of targeted leads. We had the shirts. We had business cards that wowed everyone and cool follow-up stickers as giveaways, that got even MOO impressed. We pitched and networked and targeted and stocked. We got up early and went to bed late and stood on our feet all day long. How many new paying customers do you think we got? If you guessed zero, you’re right. Our survey shows that while most founders expected all the above, 70 percent of them never achieved any of these goals. And while 100 percent of them exchanged business cards, and over 90 percent followed up on relevant leads, more than 60 percent said nothing substantial came out of it. Have a printed version of the lineup. Tech conferences so often have network overload and notoriously slow connection. Follow the event’s hashtag on Twitter. If you see great quotes pouring out of a talk, rush over. Follow the speakers on Twitter in advance. It will give you a feel of who’s really interesting to you, and not just who’s considered a star right now. So, you added all the talks by influencers to your calendar. Now go back to the event’s lineup and add some fun events to your calendar: parties, meetups, drinkups and live concerts. Take time to rest, shower and dress up for the fun part. Look dashing – you’ll feel better and attract more people. Socially awkward? Think of a few opening lines and anecdotes before you head out. Alone at the conference? You’re not the only one, tweet “who’s going to x?” to find others who need a buddy. Drink enough to feel at ease but avoid a hangover – you have work to do tomorrow. And now the important part: Perfecting the pitch. 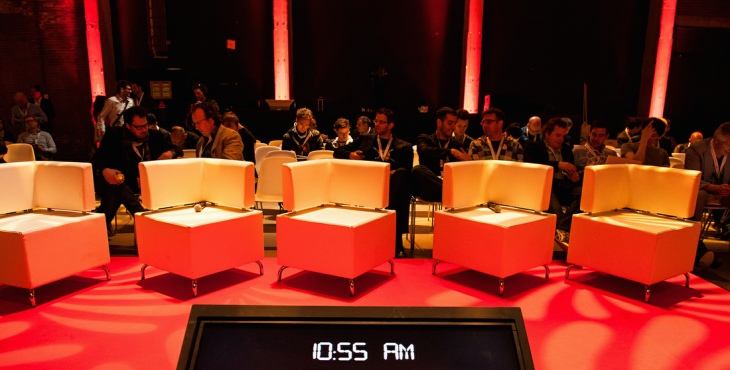 A conference is like basic training for startups, so don’t be afraid to break some sweat. Before starting your pitch, ask the person you’re talking to what they do and actually listen! It will help you decide what part of your pitch to emphasize, and make them more relaxed and ready to listen. Say your pitch to anyone who’ll listen. Then write down notes to yourself after every pitch. Every couple of hours, get your team together, share people’s feedback to your pitch, improved based on that and go back out there to practice the new version. Do the same at the end of each day. Don’t be embarrassed: Rehearse your pitch to one another and in front of the mirror or in the shower, out loud. Tom Cruise doesn’t improvise and you shouldn’t either. Don’t be afraid, go ahead, meet the so-called competition. It’s a great chance to crystalize your unique value proposition. Go up to the competition, introduce yourself before you ask questions. Share something real, it will usually be rewarded with the same behavior. Create a competitive landscape chart for yourself, and try to fit in all the other players you met at the event, who are from your field, into the chart. This will give you not only a much better understanding of how you differ and which aspects of your unique value you need to strengthen, but also a deep understand if the field you’re operating in, its trends and where its heading. In the end, you’ll reach a far deeper understanding of what it is your own startup does. This is the almost magical part of the process, and the reason tech conferences are so well-positioned to help you achieve this understanding: it’s the couples therapy effect. This mirroring, times the number of people you did your pitch to during a conference, equals the depth of your new understanding as to what it is you do. Plus, you get the bonus of understanding how to better communicate what you do, so that others will hear exactly what you’re saying. But is it worth traveling halfway across the world? Yes, and this is why: Gaining a better understanding of what it is your own startup does is priceless. When you’re in the trenches, day in and day out, and can’t see past the end of your nose, understanding what your product is really about, what it is going to contribute to the world that is unique, is your single most valuable asset. It can save you months in misdirected marketing and developing unnecessary features. A misperception of what you do, can cost you not only time, but missed funding opportunities too. So, is that worth about $5,000? (Round trip for four, accommodation, b-cards, giveaways, insurance etc.). Well, if you measure it against – let’s say if you’re lucky – six months of salaries wasted on the wrong direction, I’d say yes. And that’s why you should keep on going to tech conferences. Just remember what to expect, and don’t forget to have fun.